MP-80 is the classic metronome ticks next to beautiful sound always accurate tempo. The exterior is ABS, pendulum Panel with a lid. For personal practice and piano is a metronome's pendulum, essential to the band, tempo training. We are around many electronic metronome also in recent years, but after all pendulum is easy to use and people purchase specified. 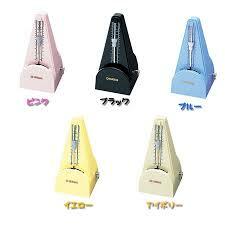 Yamaha metronome is compared to competitors rounded less clutter and the stylish looks. Popularity factor is the color variation is rich! Classic metronome ticking even when accurate tempo.